Specifically, GEM will develop a game board which aims at increasing mutual understanding and intercultural dialogue among youngsters while making fun! How it will be developed? First, teachers and youth workers from project’s countries will be involved in a training on intercultural citizenship (in January 2017) during which they will share ideas and inputs for the development of the board game, focusing mainly on the pedagogical aspects. Then, the will support the test of the board game through pilot workshops in schools and youth centres, involving at least 160 youngsters. 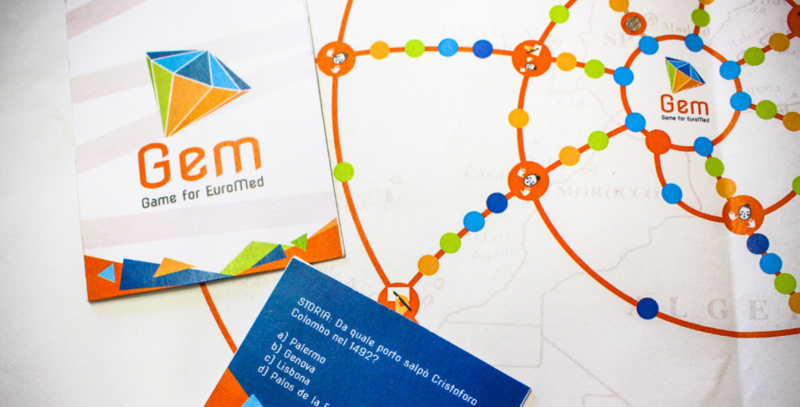 Thanks to the results on these workshops, the GEM board game will be finalised and ready to be disseminated. GEM’s partnership is composed by organisations from both shores of the Mediterranean as it involves the following countries: Italy (CESIE – coordinator), France (ADICE – Association for the Development of Citizen and European Initiatives), Palestine (JUHOUD – Juhoud for community and Local Development) and Egypt (WASEELA – Waseela for training and development). In October 2016, the partners’ organisation met online to plan in details the project’s activities and they are now working for the identification of good practices using games as tools for intercultural dialogue. This activity will support the development of the theoretical framework on the board game and the selected good practices will be collected in an open-catalogue. Ready to play together to promote intercultural citizenship? Would you like to be participate in the GEM project?